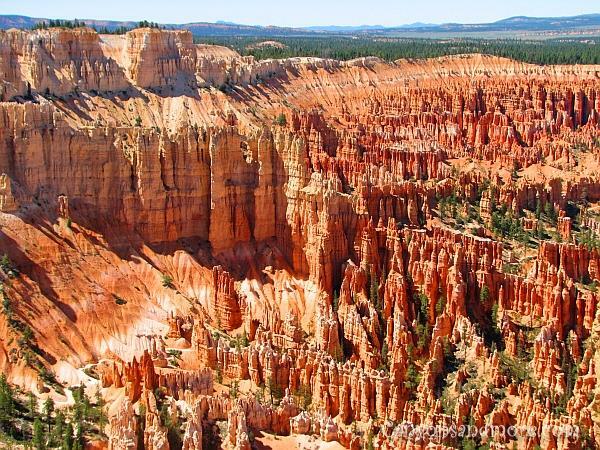 Probably one of the most unique and dramatical of all of the of the national parks in the United States is the Bryce Canyon National Park in Utah. 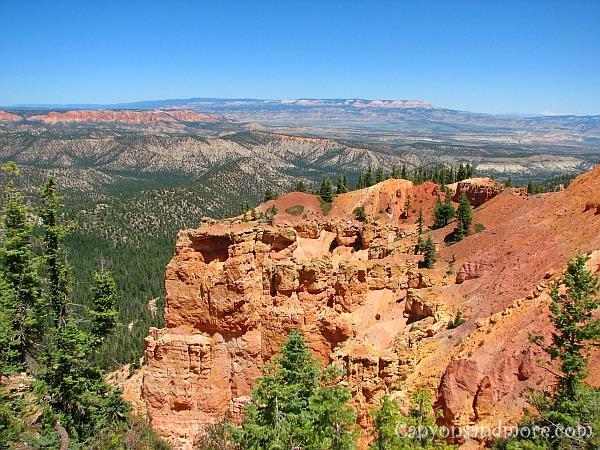 This park is well known for its geological formations of red pinnacles and spires called “Hoodoo” as well as its breathtaking steep drops exposing the landscapes below. 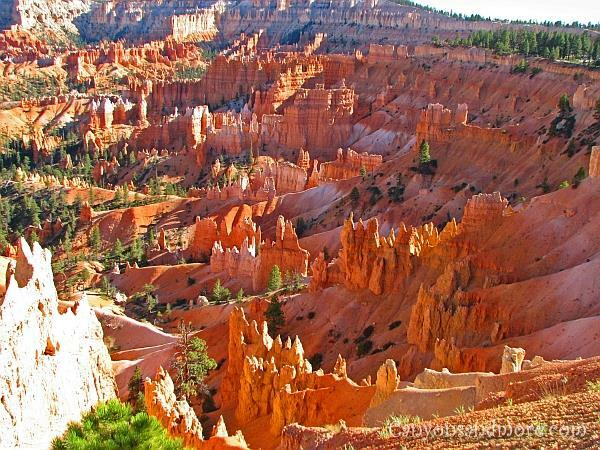 The image above shows one of the most famous lookouts is a horseshoe shaped amphitheatre overlooking a spectacular army of hoodoos at Inspiration Point. The word “army” was used on purpose because the formations looked liked soldiers lined up. A rim trail takes you along this area for many awesome views of the hoodos. The view of the park is the most majestic and impressive from this point. A fee of 25 dollars was required at the entrance and once inside you can choose to park and ride the free shuttle busses from the park entrance to many bus stops within the park. But if you prefer, you can use your own car to drive through the park, too. The visitors center offers brochures and maps packed with information about the different areas of the park and there are also park rangers inside giving tips and advice. A general store is also available to purchase souvenirs and also food and drinks. The road going through the park is about 29 kilometers long (about 18 miles). That may not seem like a lot but you still should plan at least a whole day as there are many vista points, each being worth to stop at. We realised that once evening arrived and we still had not reached the last vista point before we had to leave. Even without a map, you will easily find the stopping points as they are also indicated by signs on the side of the road. Each point has hiking trails, some are even interconnecting to the next vista point, in case you would like to stroll along the rim. 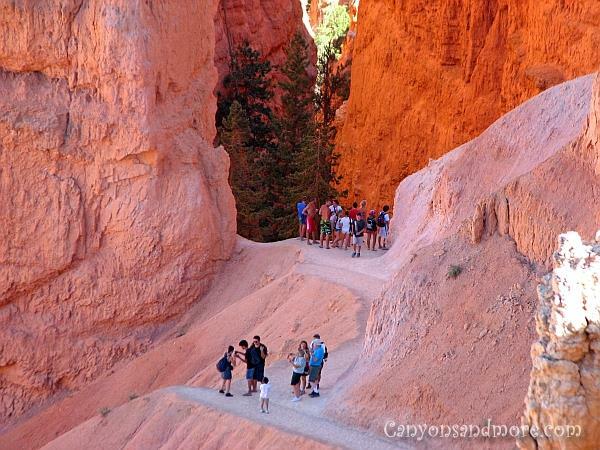 There are also many trails leading visitors deep into the canyons for an insight of how it feels to be between the hoodoos, instead of just seeing them from above. Isn’t this view just incredible? 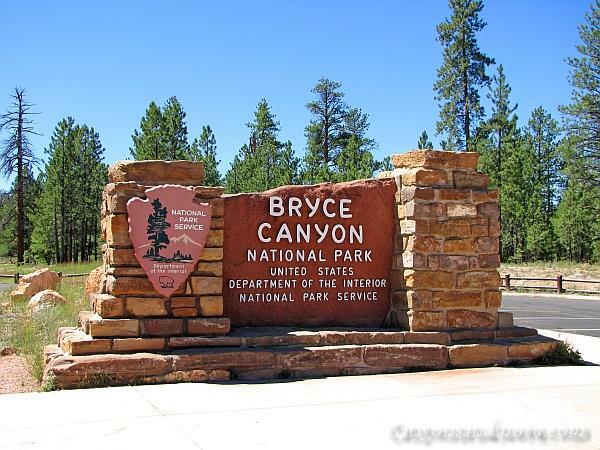 Rainbow Point is one of the many vista points at Bryce Canyon Park that you can park at the enjoy the scenery. Because the entrance is at the south end of the park and all of the vista points are on the left side, it is easier to just drive completely the north end of the park and turn around there and head south to access the vista points. This makes it easier to approach the parking areas as they will all now be on the right hand side. Some points have more parking possibilities than others so it can occasionally happen that you are not able to stop at some of the smaller areas. 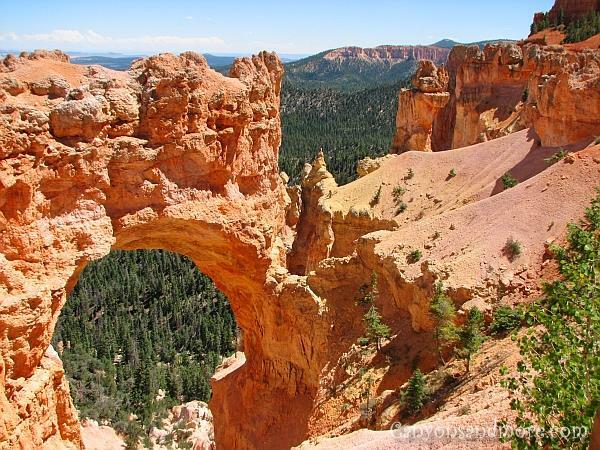 At this point you can enjoy this view of a natural bridge carved by Mother Nature herself. Practically at every point you will see the hoodoos in some form or another. One of the famous hoodoos is called “Thor’s Hammer”. 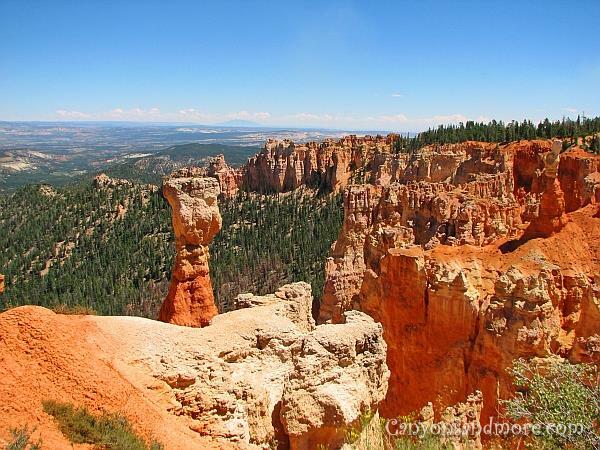 It is a fascinating looking free standing hoodoo and can be seen from the Sunset Point. Sunrise Point is just one of many of the fantastic vistas at this park and from here you can see an awe inspiring view of the Hoodoos. Walking trails can be found all over the park from each of the vista points. 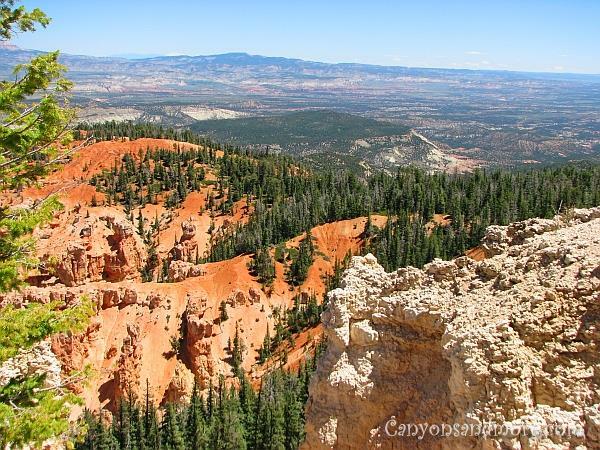 These are the best ways to experience the magnificence of the Bryce Canyons from a totally different point of view. Remember to always have enough water with you if you. It can get quite hot and there are no water sources along the trails. Chipmunks seem to be all over the park. These little guys are just too cute but hard to photograph, as they are so quick when moving around. 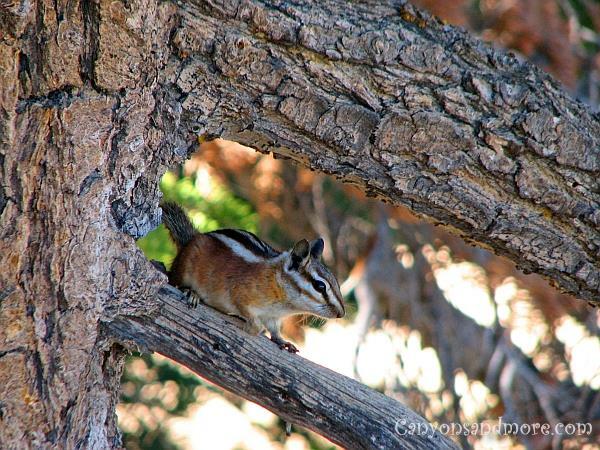 No matter which vista point of Bryce Canyon we stopped at, these adorable attractions were also there to accompany us. It was so hard to get good photos of them but one seemed willing to display his charm for our camera. Not only will you see a great amount of hoodoos in this park but there are also a lot of deer and prairie dogs. 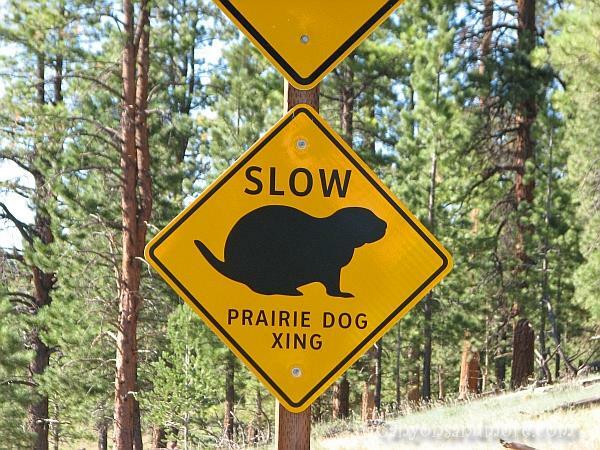 They often cross the roads so it is wise to drive slow through the park to protect these lovely animals. Every now a warning sign was on the side of the road to remind the drivers of this fact and park rangers will even stand on the sides of the roads warning the tourists to drive carefully.